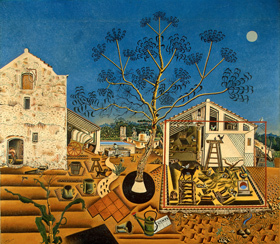 The Farm by Joan Miro (1921-2). Alcohol–and his own vituperation–was catching up to Hemingway by 1959, when, then on his fourth and final wife, Mary, he agreed to loan “The Farm” to the Museum of Modern Art. Hemingway was nervous about exposing the painting to the hostilities stirred by Fidel Castro’s revolution while trying to get it out of the country [Cuba]. He insisted that the museum insure “The Farm” and send an emissary to squire it back to New York, but no company would issue such a policy. Hemingway finally agreed to let the museum’s emissary, David Vance, take the painting, but he ran into roadblocks: The original crate sent by MoMA wouldn’t fit in the hold of the DC-7B that was to fly it out. Vance left with the promise that the crate would follow the next day–but it was delivered to the wrong airport. Meanwhile, Vance learned that he needed a permit, but the newly installed officials at the Cuban National Museum didn’t know how to get one. Eventually, another plane reservation was made for Vance and “The Farm,” for 3 in the afternoon of February 7, 1959. When Vance got to the airport, more officials wanted to look at what was inside the crate. They unloaded it, opened it, and inspected the painting but were unable to reclose it properly because they had no tools. A near-desperate Vance took “The Farm” into the cabin with him, in full view of passengers, then missed his connecting flight. He finally landed safely with his charge in New York early on a Sunday morning, and the painting eventually went on display at MoMA. And for collections managers, there’s another interesting story. While at the Museum of Modern Art, David Vance planned and directed the first computerization of a major museum catalog. In 1988, he co-authored Museum Collections and Today’s Computers with Robert Chenhall but had already left the museum field to resume a career in painting. After his troubles chauffeuring “The Farm” from Cuba to New York in 1959, I’m surprised he didn’t go back to painting sooner. This entry was posted in Collections, Objects and tagged David Vance, Ernest Hemingway, Joan Miro, Museum of Modern Art on May 21, 2012 by Max van Balgooy. Ha! I can think of a few loans in my past that made me want to quit too. Thanks for this. Thumbs up!